Toy Story Showtime! is one of many educational apps from the Toy Story franchise available for the iPad. Featuring Buzz as the main character, the app offers a solid and entertaining story arc. Buzz participates in the talent show to impress Jessie. Toy Story Showtime! opens with Dolly, who suggests holding a talent show for the toys. Buzz sees this as an opportunity to impress Jessie, and throughout the storyline we see how he works so hard to prepare his performance. Although Buzz has no knowledge or any prior experience in a talent show, he is able to learn, adapt and even innovate during the performance. Special terms, like "practice" and "routine", are shown in red. Toy Story Showtime! not only features a strong theme and a solid storyline but also introduces new vocabularies. Throughout the app, you will notice several words highlighted in red. Tapping on these terms will trigger a voiceover that explains their definitions. Finally, Toy Story Showtime! also introduces various concepts like telling jokes, acting out a drama and performing various stunts and tricks. This may become a handy reference whenever you have a discussion with your juniors regarding these concepts. Help Buzz impress Jessie by programming his dance moves. As commonly encountered in storybook apps for the iPad, Toy Story Showtime! offers some degree of interactivity. I like that you can help Buzz practice his dance moves by interacting with the device. For instance, you draw a circle to make him spin and tilt the iPad to make him slide. You can also tap to make Buzz tap his foot, twitch his arm or shake his body. 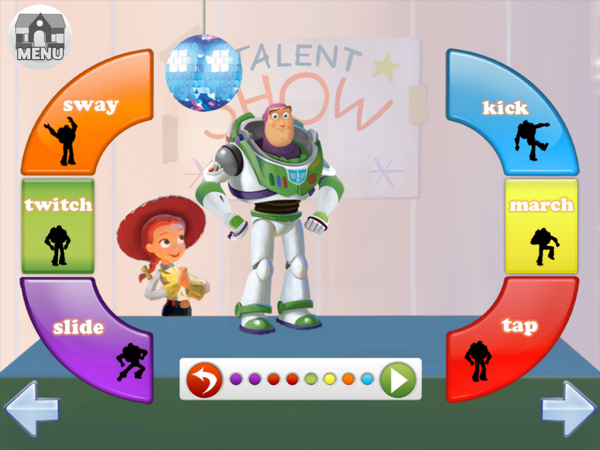 Furthermore, at the end of the storyline, you can even design a sequence of dance moves for Buzz to perform. You can make him "hop-kick-kick", for example, or "kick-march-sway". Finally, I also like that the app also includes a mini game for practicing letter recognition. A simple activity, it requires finding the missing letters for some of the terms introduced throughout the storyline. Learn words by filling in the missing letter. Toy Story Showtime! is a solid storybook app if your juniors are already familiar with the Toy Story franchise. The app does not provide character introduction, so they may need some time to recognize the cast. Regardless, it is a good reading material and a great way to pique your children's interest in talent shows.